This is it for me for a while. 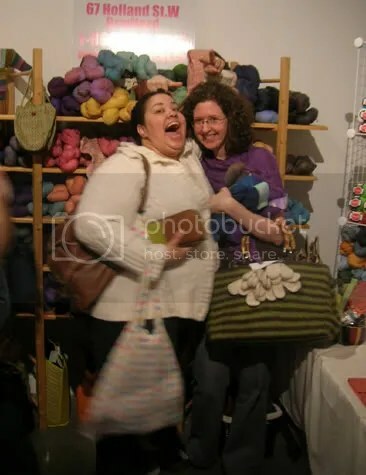 No really, for REAL, I’m totally going to have to put a pause on the yarn buying, I think I’ve done quite enough damage this month what with already supporting the New York and Boston yarn economies practically single-handedly, then carrying myself off to the Knitter’s Frolic. But the thing is, there was such good stuff there. It was so fun to go, and I would happily go again. 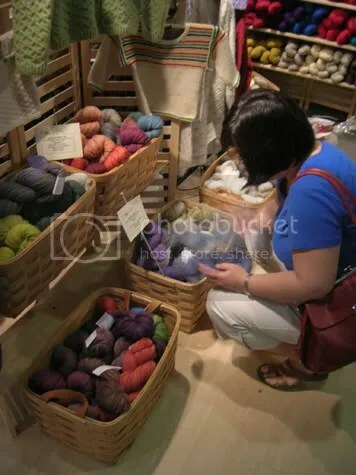 It was a treat to see vendors I wouldn’t normally get to see in person – and other knitters I know and love! I ran into Emily, Lisa, Jacquie, Sherri, Melinda, Rochelle, and many others. 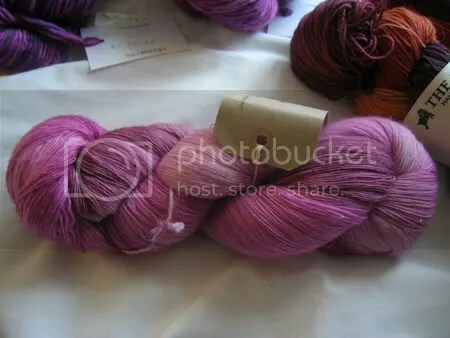 The Purple Purl ladies had some good sales going in their booth, and I have the feeling they all made out like bandits. I made out with 7 skeins of Malabrigo worsted in ‘holly hock’, and a shiny free knitting tote to carry it in. I am planning this for either an Ariann or an Hourglass Pullover. Y’all might have to help me out with potential patterns. This summer, I’m thinkin’ lace projects will finally happen. Real lace, not just lace edgings on things. Shawls ahoy! 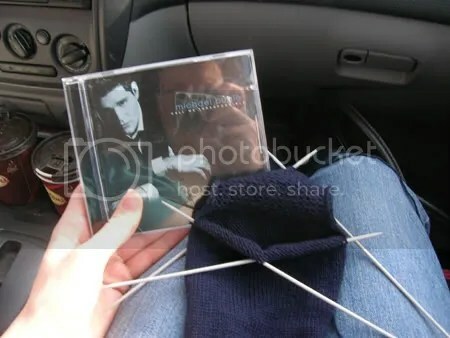 And also some Michael Buble. (I never kid about car singalongs). Happy Sunday! I wish I could just knit…but sadly these essays won’t grade themselves. Catch ya later this week my friends. Sounds like a blast. I did a little yarn shopping myself yesterday. Nothing like nice pick me up! Michael Buble RULES! I saw him on a UK TV chat show called Parkinson. This was just before he released his first album. He sang Moondance and I have been a fan ever since. Oh and lovely haul btw! Love all of them. 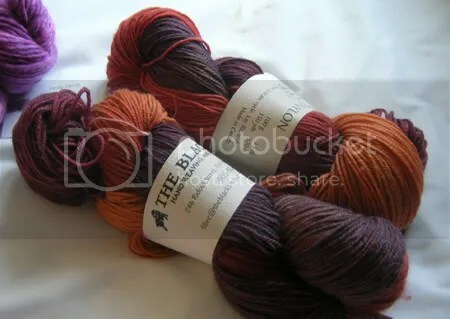 The malabrigo is talking to me, the sock yarn is scrummy and the fyberspates is so, so drool-worthy! OH YEAH BABY you’re gonna do the laceweight. You will be its slave. Allow me to enable you by bringing over Gathering of Lace next time. If only we didn’t have to work to pay for yarn…sigh…think of the possibilities! I might be homeless but darlin’ I’d have the most amazing alpaca sweaters on the block! The yarn is fab, what a store! You know I have never been in a proper yarn store as we don’t have one near. That Malabrigo is beautiful! My sort of colours. What a lovely Buying trip!!! Shawls are exciting, though I have only made a asmall one, it was a lot of lacy fun!! Duuuuuude…. SCORE!!! You caught me off guard, there’s a real drool mess here now. LOVE all your selections, and I’m Very Charmed with your future kneesocks yarn colours! ooh – looks like you made lots of great new stash enhancements!!!! Looks like you are having so much fun with all that yarn shopping. Wish I was there. Love Michael Buble too. Laaccceee… it’s like braaaainsss for knitting zombies…. That is a mighty fine haul!